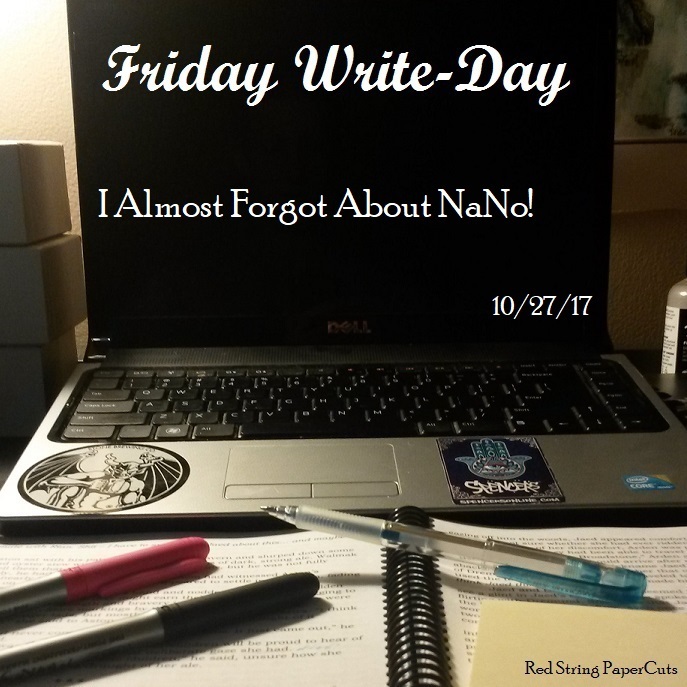 Friday Write-Day: I Almost Forgot About NaNo! I can’t keep track of October. Turns out, it’s almost over! That means it’s almost NaNo time! I have done zero prep work for National Novel Writing Month this year. But I’m not quite pantsing either. I think that’s enough, right? Whew. First official panic attack of NaNo 2017 has passed like thundercloud on a moonless night. I have basically resigned myself to not being able to write 50,000 words this year for reasons totally unrelated to my writing ability or motivation. Frustrating, but I’ve accepted it. Continue read-throughs on Manuscript: Beta of WoEM to send to my editor for revisions. We’ll say… 2/3 of the book. Goals are always important. I’ve never participated in NaNoWriMo. I write every day to make progress on whatever it is I’m working on. Bob 2.0 is in the works, and the proof edition showed me I need just a few more tweaks. But I’ll probably get another draft of Repressed done in November. To me, the spirit of NaNo is working. I think my blog tomorrow will be on just that. It’s definitely a great impetus to write. I tend to work in sprints anyway, so NaNo is the perfect excuse for me to write as much as possible. Can’t wait to read your post about it! haha I can really relate- I nearly forgot about Nano too 😉 These look like great goals to have! Good luck!